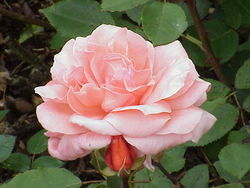 Rosidae is a botanical name at the rank of subclass under the International Code of Botanical Nomenclature. Circumscription of the subclass will vary with the taxonomic system being used; the only requirement being that it includes the family Rosaceae. The Phylocode definition includes Crossosomatales, Geraniales, Myrtales, Fabidae, Malvidae as they are defined in the APG III system. This definition was formulated in 2007, and is agnostic on the inclusion or exclusion of Picramniales and Vitales. Since 2007, the positions of Picramniales and Vitales have been clarified. The position of Picramniales as sister to Malvidae sensu stricto requires it to be included among the rosids. In both senses, the term "rosid" applies, as an adjective and noun, to members of the group. Subclass consisting of 116 families, and more than 60,000 species of angiosperms - the largest subclass in terms of number of families and about the size of the subclass Asteridae in number of species. They are more advanced than the Magnoliidae by being syncarpous and less advanced than the Asteridae by being largely polypetalous rather than sympetalous or having more than two fused carpels. The Rosidae has been distinguished from the Dilleniidae in that species with numerous stamens have the stamens initiated in centripetal sequence and usually do not exhibited parietal placentation which is common in Dilleniidae. ↑ Rosidae USDA, NRCS. The PLANTS Database. National Plant Data Team, Greensboro, NC 27401-4901 USA. 29 January 2013. This page was last modified on 24 May 2017, at 10:01.